The Fall 2016 session of my online video course Intro To Hand Tools starts September 16 at Popular Woodworking University, the online education component of Popular Woodworking Magazine. The course consists of 12 hours of instruction for $59.99. If you'd like to learn how to do everything with hand tools or just add some hand skills to your power tool woodworking, whether you're a new or experienced woodworker, this is for you. Why do everything with hand tools when there are perfectly good power tools available? The practical reason is lack of access to power tools or lack of space for them. A small hand tool workshop is an excellent option for anyone with limited space, as little as 4'x6'. It can even be portable, with a workbench that folds up to be put aside when not in use. The less practical reason is that it's a lot of fun, very satisfying. Skills covered include sharpening, rough and fine stock preparation, simple and fine joinery including mortise and tenon and dovetails, and curved work. These are used in furniture making, cabinet making, musical instrument making, boat building, and home building and repair. The course runs September 16 through November 16. During this period you can join the online discussion and ask questions. You have unlimited access to the videos during and after the course. You can watch them at your leisure on your schedule as many times as you'd like. 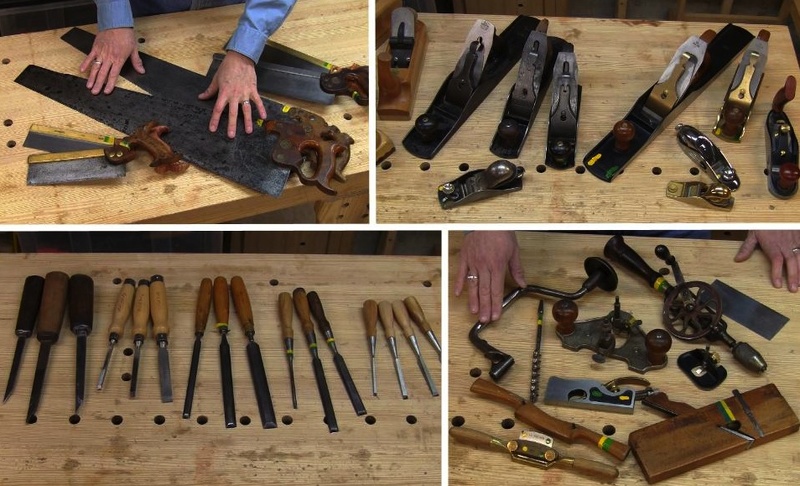 For a full episode guide, see this blog post: 59 Videos: Intro To Hand Tools. To go to the course description and registration page, as well as read reviews from past sessions, click here.